I've mentioned this before but I've never been a fan of Lindt chocolates. They aren't bad, and I know a lot of people really enjoy them, but I find their chocolate bases to be overly sweet, so whatever flavoring is mixed in is usually no where near as bright and flavorful as it could be. I feel like this makes a lot of their products taste the same. Which is especially true with their individually wrapped truffles. Whenever I see them in a candy bowl or dish, I avoid them. (I have some downstairs that were given in a bag of part favors a few weeks ago that I can't bring myself to eat.) Lindt just isn't my favorite brand of chocolate, but I'm a total sucker for interesting packaging and graphic design. When I saw this line for the first time I was totally smitten. I love how playful this is! Lindt's usual packaging and aesthetic is more stuffy and it takes itself very seriously, and this is the complete opposite! We have rainbow lettering, chalkboard-like imperfect fonts, and even little speech bubbles and doodles? 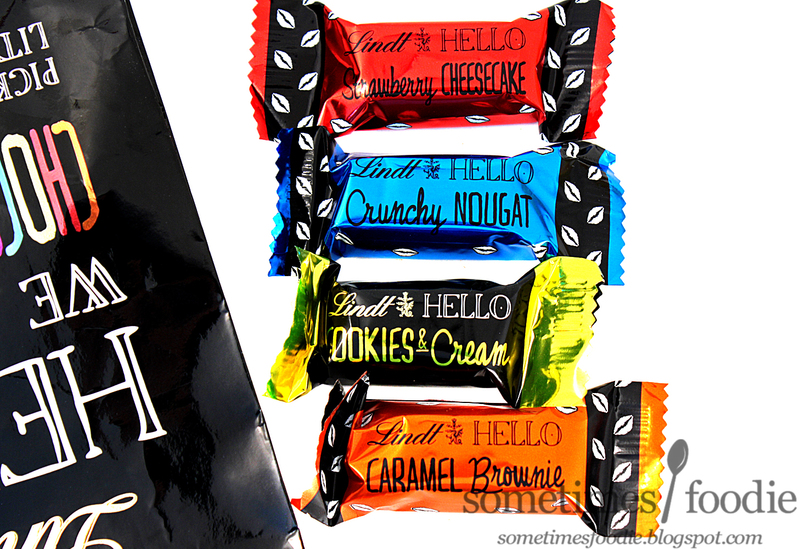 It's so different from everything else I have seen Lindt produce, and it's a breath of fresh air. I figured if the design was so drastically different, and I loved it so much, I should give it a try. Inside this bag we have four different flavors. 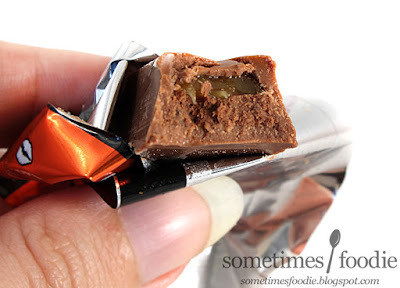 Caramel Brownie: Milk chocolate outside, with caramel, chocolate filling, and little crispy chocolate bite. This tastes sweet and caramel-y, but I'm not getting much "brownie." I really like the caramel flavoring in this, but I wish the bar had been dark chocolate to help offset some of the sweetness. 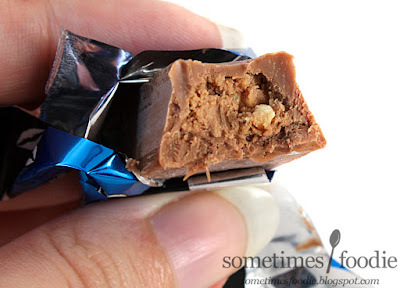 Crunchy Nougat: Okay, what kind of nougat is this? 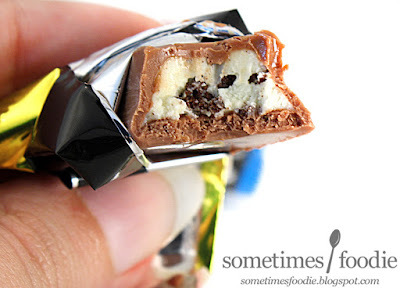 It's just chocolate with crispy bits in it. The crunchy bits have a lot of delicious hazelnut-like flavoring, and a pleasant texture, but what does any of this have to do with nougat? This was okay, and I liked it a lot more than I thought I would, but it's just not nougat-y. 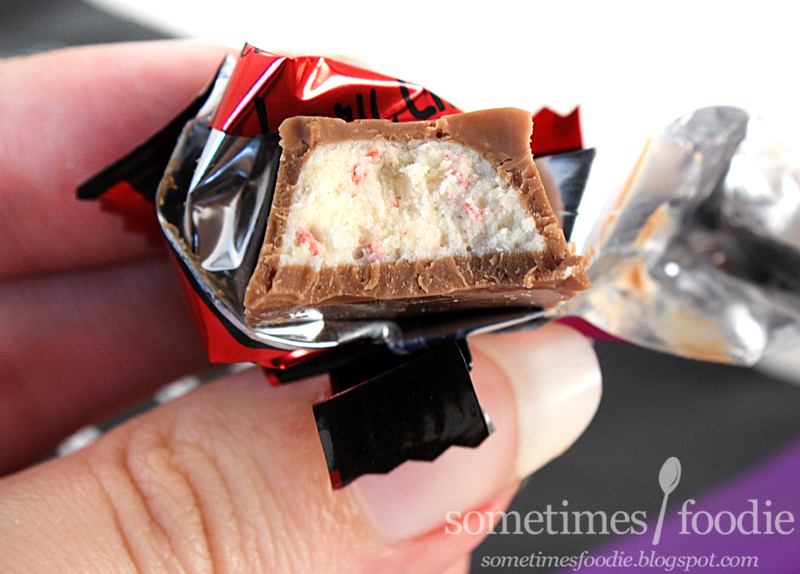 Strawberry Cheesecake: Normally I hate fake strawberry flavored chocolates, but I like this. The filling is very tangy with a hint of strawberry from the crunchy red bits, and the milk chocolate outside isn't overpowering. 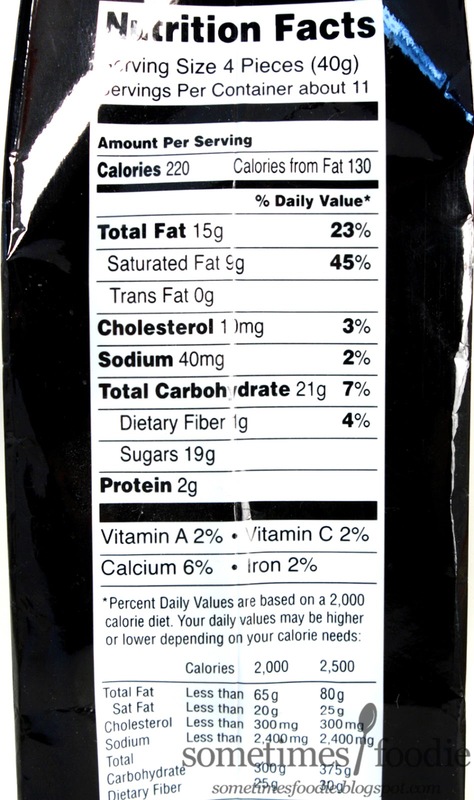 It's not a candy bar I would ever buy a full size of, but it's way better than I expected. Out of the four, I found myself going for the Cookies & Cream more than any of the others, which is interesting, since I usually don't like white chocolate confections. My sister really likes the cheesecake and nougat bars, so there's a little something for everyone in this flavor mix. Overall I feel like this is a great gift item, thanks to the beautiful packaging and easy share-ability, but I won't buy this again for myself. 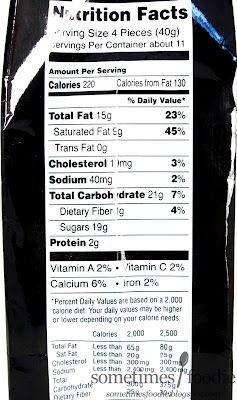 If anything I'll be buying a full sized Cookies & Cream bar, but I did like that I could try a lot of the flavors in their line in this mix without having to commit to just one. 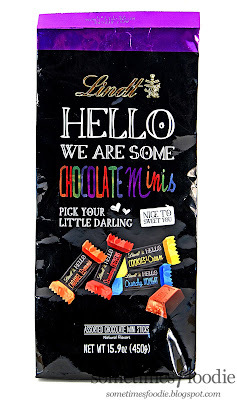 I hope Lindt comes out with more of these mini-bar mixes so I can try even more flavors in the future.